Toronto Weather in December is very cold, windy and snowy - especially second half of the month. Toronto receives major part of snow in December. The wind chill factor makes the freezing temperatures even harsher. Frequent snow squalls, ice pellets and freezing rain are very common in December. However, the weather pattern has changed in last 5 years or so. We do not receive much snow now in December and temperature is also not very harsh as it used to be few years ago. But top-notch museums and art-galleries, excellent theatrical performances, power-packed NHL games, underground shopping and above all numerous incredible Toronto hotel deals (except Christmas and New Year holidays) overcompensate the brutally cold and unpredictable Toronto weather. If you're scheduling a Toronto vacation during December, double check the average low temperature, record low numbers and snow accumulation for the month. December is month of festive season and Christmas shopping. 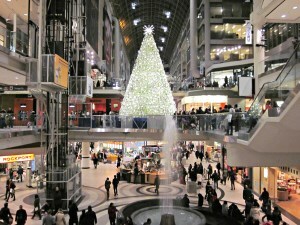 Many shopping malls and boutique stores offer great discount and sale for Christmas and New Year shopping. Check out Eaton Centre, Bloor-Yorkville shopping street and Queen Street West for some attractive deals on designer and trendy clothes, shoes, accessories and much more. Join spectacular New Year's celebration and enjoy live music, ice skating and fireworks display at Nathan Phillip Square. Several downtown Toronto buildings and places offer dazzling Christmas lighting, displays and decoration. Cold Toronto weather in December means it is time for indoor activities and Toronto offers lots of things to do  enjoy magnificent performance at Toronto theatre, visit our world-class museums, explore the PATH (an underground network of shops, restaurants and attractions) and Maple Leafs hockey game. 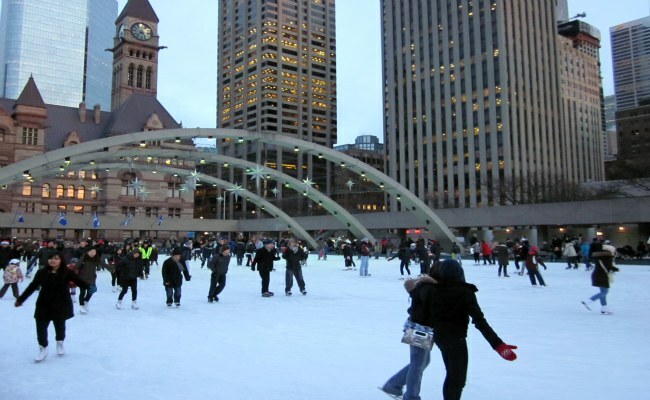 December also offers great opportunity for several winter outdoor activities like ice skating at the Harbourfront Centre and Nathan Phillip Square. If you are more adventurous, there are lots of good spots for snowboarding and cross country ski within an hour drive of the city. Toronto receives major snow and freezing rain in the month of December. However, isolated warm spells are quite possible. You should be prepared for cold and chilly weather conditions. Pack a warm, heavy winter jacket or coat and clothing that can be layered.